Fifty-two years ago my friend Bob asked me and another young teen to camp out for a single night on an empty spit of land that juts into the Halifax River in our hometown of Holly Hill, just north of 11th Street (now LPGA Blvd.). We three guys squeezed into a small tent without knowing that 61 years earlier only 100 yards or so from where we had pitched our tent, was the home of one of Holly Hill’s most famous men – one of America’s most successful rumrunners during the Prohibition. Yet Bill McCoy was a teetotaler which I learned from local historian Beth Mindlin in 2007 at her Halifax Historical Museum lecture which informed us that McCoy stood 6 feet 2 inches tall and had “a voice like a foghorn” when he moved to the sleepy hamlet of Holly Hill in 1900 and set up a ship-building business with his brother Ben in a deep basin boat slip along the Halifax River, building first the Yankee Doodle and then the Columbia in 1902 and in 1903 the Uncle Sam, an excursion boat. Sometime later they built luxury craft for Cornelius Vanderbilt III and also Andrew Carnegie. The Halifax Historical Museum in Daytona Beach has a permanent display about Bill McCoy, his rum running, and his ships, and Frederic Van de Water’s The Real McCoy (Flat Hammock Press) is the definitive biography. In addition to their excursion business on the Tomoka River, the McCoy brothers transported freight and passengers between Daytona, St. Augustine, and Palm Beach until roads and buses proved too competitive for them, and according to Sally J. Ling, in the 1920s the brothers turned to smuggling booze, using their newly purchased white oak 90-foot fishing schooner, the Henry L. Marshall. Beth Mindlin said that during his “career” McCoy transported 175,000 cases of scotch and rum. McCoy bought the Arethusa, which local historian Bob McKenna called “the pride of the Gloucester fleet” in his lecture on McCoy at the Halifax Historical Museum in 2007. Sally Ling wrote that McCoy registered the ship with a British registry because the American Coast Guard couldn’t board a foreign ship if it was outside the three-mile limit of U.S. territorial waters. He renamed it Tomoka, but to hide its identity he registered the same boat with the French as the Marie Celeste. Authorities trying to overtake McCoy could only get close enough to photograph his boat, but according to McKenna, at least once McCoy slipped away from the Coast Guard into backwaters after they had spotted his boat as the Tomoka, and he quickly removed the Tomoka nameplate and screwed on the name Marie Celeste. McKenna noted that McCoy would keep the Tomoka safely three miles offshore – outside of U.S. territorial waters – where he could have high-speed “contact boats” powered by used WWI airplane engines rendezvous with him to take his shipment ashore in boats that could outrun the Coast Guard. 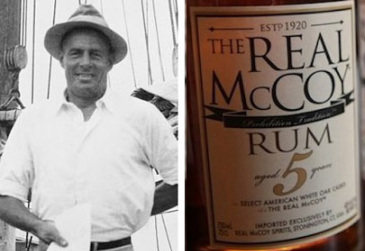 McCoy was so successful that the U.S. changed maritime law, making territorial waters extend to 12 miles from shore, but McKenna says that McCoy even used a seaplane to offload his smuggled rum. McCoy made a trip per month and McKenna said that each trip cleared $100,000, but a Time Magazine web page cites Edward Behr’s book Prohibition as saying that McCoy “made $300,000 in profit for each trip,” and according to Wikipedia, rum-running became such a problem that 20 U.S. destroyers were transferred for use by the Coast Guard. At one time, McKenna said, McCoy had five schooners and two other boats, and Mindlin said that McCoy developed a safer transport system with the bottles of rum stacked, not in cases, but as a pyramid of six bottles sewn into burlap, called “hams” because of their appearance. To continue his rum-running, McCoy moved to Nassau where, Mindlin says, proceeds from the numerous smugglers buying the islands’ booze allowed Nassau to pay off debt owed to England. McCoy had a Newfoundland dog named Old Faithful that he left one evening to guard money in the ship’s cabin when he went ashore, and the next morning, Mindlin says, McCoy found his dog outside the hotel door. It had jumped ship, swum ashore, and found his master. The dog also demonstrated its intelligence after it saved a boy who had fallen from a dock, but the dog apparently enjoyed the praise as hero so much that it began seizing other opportunities to push boys into water to save them, too, so it could win new praise. Local connections with the McCoy brothers of Holly Hill include their purchase of The Sweetheart, a boat belonging to Commodore Charles Grover Burgoyne, Daytona philanthropist and benefactor. The McCoys used the boat as passenger service to Okeechobee, according to Beth Mindlin. Another story uncovered by Mindlin is that Ben McCoy built a house for his wife in Daytona Beach on Earl Street, but he later divorced her to protect her from being killed in connection with his illegal rum running, and he wiped out all record of their marriage. Mindlin also found that Bill McCoy married Betty Maude Clark, a woman 22 years younger, but after several years Betty returned to her parents. Mindlin also learned that McCoy built the chimney for the home of Ianthe Bond Hebel, the author of a seminal book for local historians– Centennial History of Volusia County, and McKenna said that in later years, McCoy made shadow box models of schooners and sent them to museums, and he commissioned the painting of the Coast Guard cutter firing on the Tomoka. Some ship paintings in Halifax Historical Museum are also the work of McCoy. I was a year old when McCoy, 71, died on December 30, 1948, of a heart attack and complications of ptomaine poisoning aboard his Blue Lagoon in Stuart, Florida, as Sally Ling has written. Bob McKenna adds that McCoy’s ashes were scattered by a St. Lucie buoy near Stuart, but several members of Bill McCoy’s family remain not far from Holly Hill. Bill’s bootlegger brother, Ben, who lived to be 86, is buried in Pinewood Cemetery, appropriately across the street from Daytona Beach’s Boot Hill Saloon, and both of their parents are buried there as well. Their sister, Violet, though, died in Iowa in 2005.